You’re rushing to get ready and spill nail varnish on your carpet. But don’t panic – Rug Doctor can help. Try our High Foot Traffic Cleaner to get rid of all your makeup spills. It’s designed to tackle grease and oil-based stains, so it’s perfect for removing products like mascara. 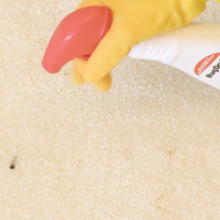 This intelligent trigger spray breaks the bonds within the stain that become embedded in your carpet fibres. It’s also great for using on other dirt and grease stains in the busiest areas of your home. 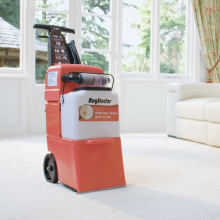 The High Foot Traffic Cleaner is a pre-treatment, which you can use before refreshing your carpets with a Rug Doctor machine. Shake the trigger spray bottle and switch the nozzle to the ON position. Spray High Foot Traffic Cleaner evenly over the area. Leave it to do its magic for 5-10 minutes. Then, use a Rug Doctor carpet cleaning machine to make your home look like new. You can also use our Oxy Power Stain Remover on makeup stains, which removes their colour in a flash. It contains all the cleaning power of bleach but won’t damage your carpets. Whether you’ve dropped classic red lipstick, smoky eyeshadow or your favourite eyeliner, your night out won’t be ruined thanks to Rug Doctor. Put your mind at rest with our products today.